This brightly-coloured, circular sculpture achieves a dramatic pictorial presence. Its flowing, window-like form becomes a framing device capturing the dynamics of ice-skating. The push of the blade, as it cuts into the ice surface to propel the skater forward, is exemplified through a myriad of cutout shapes. These forms evoke the style of Henri Matisse, and combine to create the sculpture’s dynamic form. 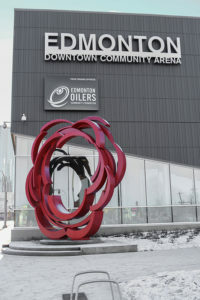 A stepped, podium-like plinth combined with the sculpture’s frame-like form create a welcoming symbol for the area—an artwork functioning as a place-maker identifying the facility and the activities therein. Biography: Douglas Bentham, RCA lives and works in a rural setting near Saskatoon, Saskatchewan. The recipient of numerous awards, Bentham graduated with a BA Advanced degree in painting from the University of Saskatchewan in 1969 and a MFA in sculpture in 1989. His sculptures can be seen in many settings across Canada.